Lim "NesTea" Jae Duk is a Korean Zerg. He was one of the top ranked zergs on the Korean ladder shortly after the launch of Starcraft 2, and eventually became a 3-time GSL champion. In Brood War, NesTea used the ID "ZergBong". He played for the Korean pro-gaming team "KT Rolster". 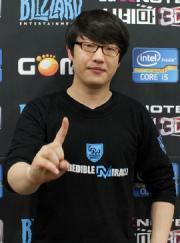 He was most notable for his 2v2 performances with Reach, as well as being a coach for KT's zerg roster. At present, NesTea is ranked #325 in highest overall earnings, and #63 in highest earnings for players from Korea, Republic of. Out of the 57 tournaments awarding cash prizes that NesTea had competed in, the largest amount was $88,648.55 from GSL Open Season 2 on November 13, 2010. He placed 1st, making up 30.76% of his total prize money won. NesTea overtook the $100,000 milestone on February 10, 2011, winning $1,486.90 and placing 1st at GSTL February 2011. Prize money from 7 tournaments got him to that point.